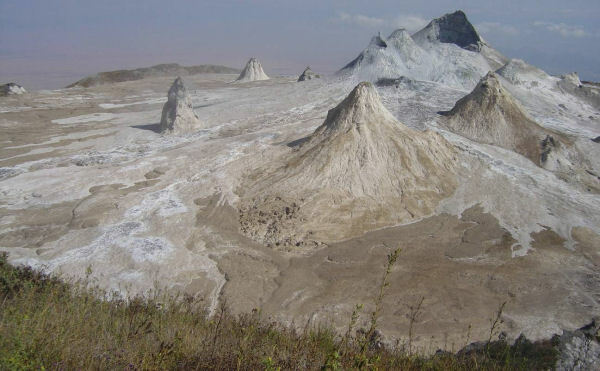 Lengai is one of the more accessible active volcanoes in the world and is of interest to a number of geologists, some of whom have visited the volcano many times and maintain records of its activity. 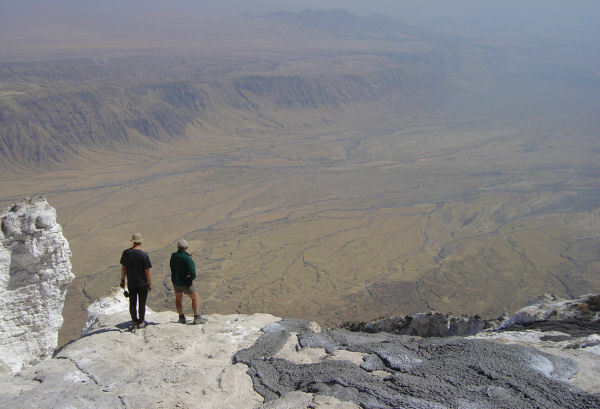 Two individuals in particular have studied the volcano over many years, were on the volcano for some of the time this expedition was there, and maintain websites dedicated to the volcano: Celia Nyamweru and Fred Belton . The expedition was fortunate enough to visit Lengai during a period of minor volcanic activity. In an effort to add to the work of the individuals above, many photos were taken of activity in the crater. A limited number of the photos are shown below (Figure 24 to Figure 28 below), but for a more comprehensive photo visit the web site for this expedition being prepared for the by Hugh Anderson. 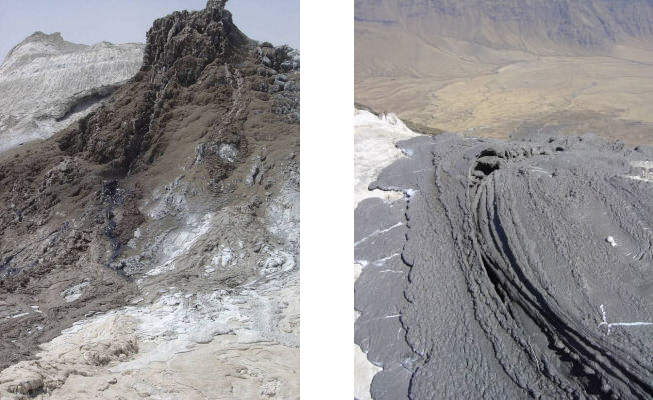 Figure 23 Small scale features of lava flows in the crater of Ol Doinyo Lengai. (a) Central channel from late-stage small-scale flow in a fresh lava channel in the south of the crater on 26th July 2004. Central channel is approximately 200 mm wide. (b) Texture of top of lava flow in northern part of the crater on 4th August 2004. Camera case for scale is approximately 20 cm long. (c) Viscous lava flowing on top of recently erupted lava sheet. Flow is approximately 60 cm across. Northern part of crater, 30th July 2004. 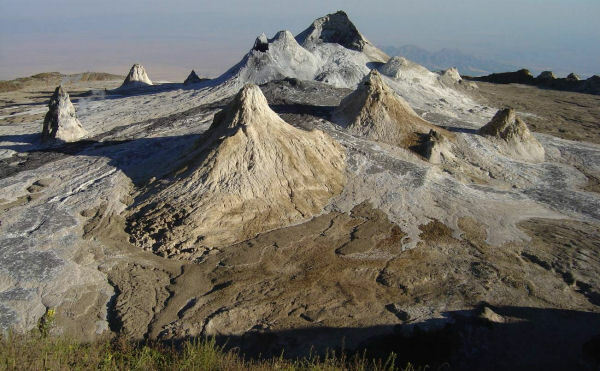 Figure 24 The northern (active) crater of Ol Doinyo Lengai on the morning of 26th July 2004. The black lava flow emanating from the low vent in the centre rear of the picture had erupted the previous day and was still warm to touch. Photo taken from summit on the crater rim. Figure 25 The northern crater on the morning of 4th August 2004. Note that the fresh black lavas seen in Figure 25 had weathered to light grey by this date. Photo taken from the crater rim approximately 100 metres east of the summit. Figure 26 A small trickle of lava flowing from a growing hornito on the northern side of the crater on 4th August 2004. Figure 27 Fresh lava overflowing the northern lip of the crater on 30th July 2004. Figure 28 Dark grey lava flowing down the northern lip of the crater on 30th July 2004. Lengai base camp was on the plateau below the volcano, just between the heads of the figures in the photograph.